Congressional Forum is the Chamber's public policy series featuring local, state and federal representatives to speak about issues relevant to the area's business community. 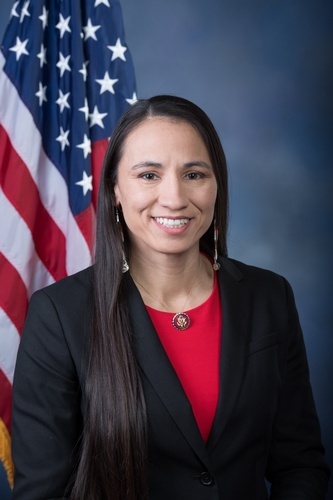 This month's installation will feature Rep. Sharice Davids. Representative Davids was raised by a single mother, who served in the Army for 20 years. After graduating from Leavenworth High School, she worked her way through Johnson County Community College and the University of Missouri-Kansas City before earning a law degree from Cornell Law School. As a first generation college student who worked the entire time she was in college, Rep. Davids understands the importance of quality public schools and affordable higher education. It is that foundation that allowed her to go on to a successful career, focused on economic and community development, which included time as a White House Fellow under President Barack Obama. Rep. Davids wants others to have the same opportunities to achieve their goals, which is why she has centered her career on bringing more opportunities to the middle class. In Congress, Rep. Davids is putting Kansans first, working to limit the influence of special interests and fighting to make health care more affordable and accessible to everyone. Rep. Davids was sworn into the 116th Congress on January 3, 2019. She is a resident of Roeland Park. ***Please note*** Congressional Forum Membership is separate from KCK Chamber Membership. Members pay an annual fee of $400 to attend 12 events in the year and premium members pay $600 with an opportunity to bring a guest. ALL GUEST FEES MUST BE PAID FOR IN ADVANCE, BY CREDIT CARD AT TIME OF REGISTRATION. If you should need to cancel your reservation, refunds will only be provided to those 72 hours prior to event. Thank you for understanding.